Sorry I don't have time to explain in greater detail, I'll let the pictures do the talking. -Machine screw, 3mm or 4mm or 1/8"
With these things you can simply suspend anything off the Electrohub and have it be isolated from vibration. No need to enlarge any of the holes to fit the vibration dampeners. 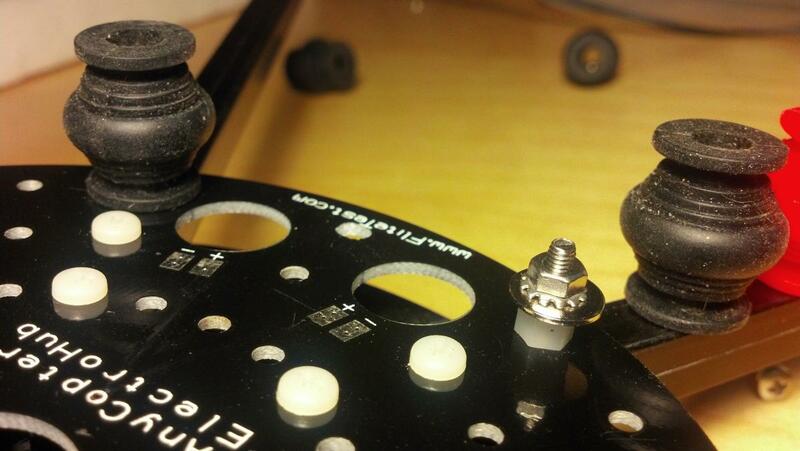 Use any of the existing small holes in the Electrohub plate to place your vibration dampeners wherever you like. Just carefully slide the bulb over the washer, it's amazing how well it holds, especially if the washer is centered and really locked on to the screw. Use some kind of Loctite on the washer and nut otherwise they'll undo themselves. I'd secure the whole thing with a short piece of monofilament or string, just in case something rips out all your vibration dampeners and sends your battery, gimbal and camera flying. I plan on suspending a 1mm plate of G10 and then mounting rails to that to carry the battery and gimbal. Those red ones are really expensive. I bought some of these cheaper black ones and they work great for eliminating jello but are pretty squishy. I like what the OP has done to secure the damper balls to the frame. I've been press-fitting them into places where they really don't hold 100% and everytime I crash and sometimes during hard landings they keep popping loose. Those red ones are really expensive. Do the bolt, washer, and nut inside the ball impede it from compressing? Wow! That's a good deal. I'm sure it's one of those things where if you bought 1000 of them the unit price is probably 3 cents. Dependence on this dampener part bumps the price up over $5 but it's definitely a simple solution and can be done with non-metric hardware as well. I'm positive the holes in the plates can accommodate 1/8" screws with a little boring out. The plate holes definitely can accommodate 4-40 hardware, the holes are actually a little bigger. My micrometer says the holes are 3.5mm. In any case, a set of matching screws, washers, spacers, and nuts in a non-metric size is probably a cheaper alternative. Just depends what you've got on hand. I looked into silicon dampers and they are indeed quite expensive. I'm glad to see some, whether of equal quality or not, available at a reasonable price. It doesn't seem like it. The washer ends up just about 1mm above where the ball would normally be enclosed by the hole in the plate, so it doesn't seem to get in the way at all. These vibration dampeners really aren't about "travel" anyway so much as pliability. The entire mid section of the ball is unoccupied and seems to dampen exactly as before. I have no science to back that up but it sure feels that way to me. Thanks! I just liked it because it kept the component count and complexity down. No CNC router needed. Looks like Codemonkey found a cheaper source for the dampener ball thingies. Almost certainly still from the same manufacturer (hint:mainland Asia) but the price is better. Just doing a few tests here. You probably could get away with a smaller washer. 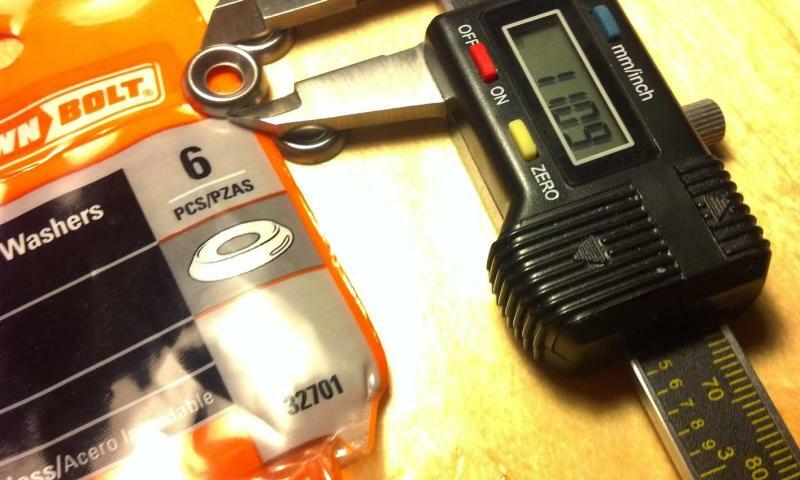 10.75mm is still pretty tough to pull out through the bulb opening. 12mm may be a little too big to get in without potentially weakening the silicone dampener, more so with the 300g rigid ones. If nothing else it's a little challenging to jam that 12mm washer through the 8mm opening without forceps. I'd bet 11mm is probably the sweet spot. I quit trying all the other vibration dampening methods after I tried silicone bearings. The old methods like wire suspension, foams, rubber bands, bubble wrap, etc. simply are too much trouble when these things do the job great and don't require a lot of screwing around. I used both the large orange bearings and the small black ones on my mini, and have been totally happy. The large orange ones are used on the top of the clamping plate. Here are some Crown Bolt #6 Finishing Washers (32701) that are almost exactly 11mm wide, they're widely available at Home Depot. They have the advantage of being thinner, half the weight (0.3g instead of 0.6g) and they are beveled in a way that makes them easier to get into the dampeners. 6 of them for $1.